Welcome to Class 1. We have a bright and colourful classroom for our Nursery and Reception children to enjoy learning in. The classroom is separated into different areas to encourage the children to develop independence in their learning. We have a maths area, writing area, creative area, construction area, role play area, book corner, computer table and a malleable play area. The children also have access to an outdoor garden area. We love to use our imaginations to support our learning in class 1. 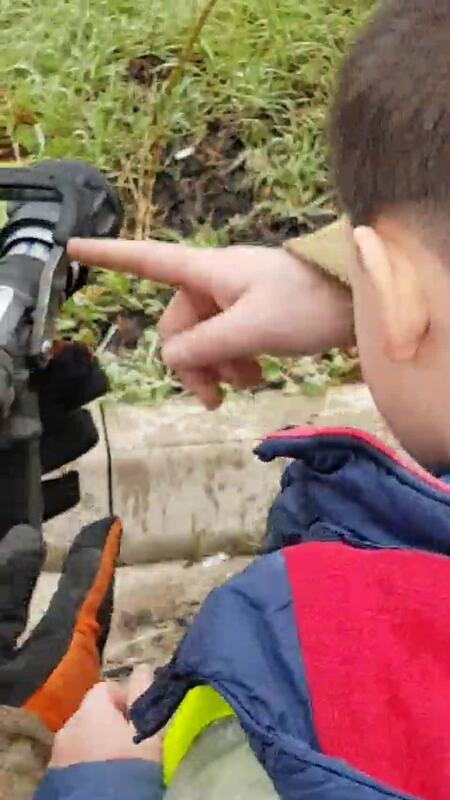 The children are taught using a balance of adult led and child initiated activities which enables them to immerse themselves in new and fun learning experiences. Please keep checking our class page for updates on our learning. Our trip to the The Bell. What a fantastic experience for some of our nursery children and our reception group. We had a fantastic time at the pub with Mr and Mrs Leighfield and Justine. We talked about healthy and 'sometimes' food, different types of bread and how to cook chicken safely. The children got to cook some Cajun chicken with Steve, then butter bread, chop vegetables and build their own sandwich. They all got to taste their sandwiches whilst watching deliveries arrive at the pub and see how the barrels got delivered into the cellar. Thank you so much Kerry, Steve and Justine for a really valuable experience for our children. Programming in Class 1. The children have been programming the Bee bots to travel under their instructions. They children had to program them to travel to each other, to turn a corner and to go under an obstacle. Mother's Day topic sharing. Today (Friday 29th March 2019) the children invited their mums into Class 1 for lots of activities about mums. We started with reading a story called, Mother's Day by Shirley Hughes and getting lots of cuddles off their mums. We then set about the task of completing our rainbow challenges. These included; decorating cakes, making a bouquet of flowers for mum, colouring in some spring pictures, reading a story together and sharing our writing about mum. Thank you for coming in and spending some precious time with us. Have a very happy, restful Mother's Day. Tasting fruit from the story Handa's Surprise and making our own fruit salad. Making bread and cooking on an open fire in Forest School. During Science week the children have learnt all about journeys. We have explored air, speed, ramps, dinosaurs, tunnels and lots more. We started with a workshop trying to keep an egg safe and uncracked on its journey from space to earth! We also tested different liquids travelling down a ramp to see which one was the quickest and slowest. We had a fantastic morning today (Thursday 14th February). Lots of parents came to share the end of our superhero topic and take part in a range of messy art activities. Thank you so much for coming and sharing our learning with us, we hope you enjoyed yourselves. Today (Monday 11th February 2019) we had a wonderful visit from Doctor Hughes to end our Superhero topic. She talked to the children about her job as a doctor and where she works in a hospital. She showed the children lots of the clothing she has to wear in surgery and let the children dress up as surgeons. The children loved the visit and now all want to be doctors! Our role play area has been turned into an operating theatre too. Thank you Dr Hughes for another inspirational visit from a real life superhero. Trip to Evesham Fire Station. The children in nursery and reception had the great pleasure to find out how firefighters help people. They got to listen to how they use the equipment, try on the clothing and sit in the fire truck. The children also got to have a go at using the fire hose outside too. 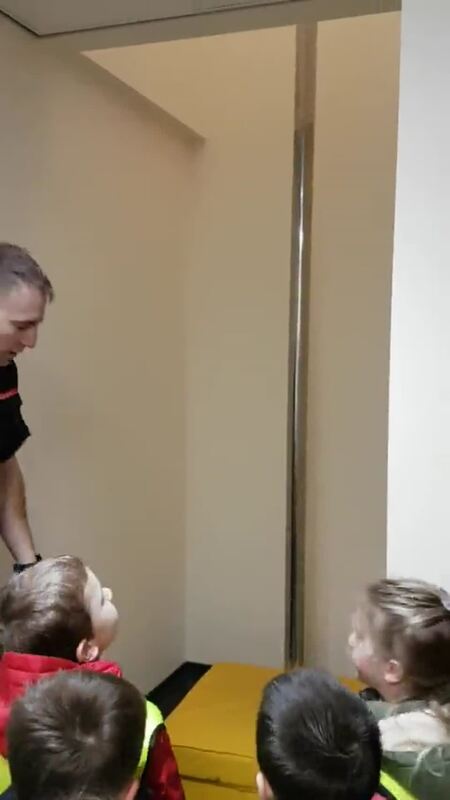 The crew from Green watch were amazing with our children and it really helped us to understand how they are real superheroes. We even got to watch them go off on a real emergency. They showed us how much they care about people they are helping with how quick they managed to get ready and zoom off with the sirens booming and lights flashing. Exciting, superhero times in Forest School. We had to use our super powers to build tall towers, balance on the stepping stones and climb the rope ladder. We finished off with some delicious hot chocolate after our hard super hero day! We had a special visit from Nurse McMillan this week. She talked to us about how she looks after people and helps them when they go to hospital. She showed us some of the equipment they use to see if people need help. The children got to test their temperature, heart beat and oxygen levels. They also go to see how nurses give injections and to wrap bandages around their cuts. Thank you so much to nurse McMillan, we think you are a real life SUPERHERO! Visit from the Police. The children in Reception and Nursery had a special visitor in the class today. The children met a police officer who talked to them about how the police are superheroes and work hard to look after us and help us. The children learnt about the uniform they wear, what types of transport they use and the different ways that they help us. The children also got to try on the uniform and also had their finger prints taken! Mr Tranmer got arrested and had to put the handcuffs on! Thank you, we think you are a real life SUPERHERO! Forest School (Wednesday 16th January). Science in forest school. The children were given the task of finding ways to keep warm today. The children came up with some fantastic ideas including; building a shelter and covering it with leaves and sticks, keeping active (climbing the rope ladder, swinging on the rope swing, traversing the balance rope and stepping stones) and finally lighting fires to keep warm. The children also toasted marshmallows, made traps for Evil Pea (like the jelly trap in our story) and had to find all the Supertato pictures hiding around forest school. Superhero vehicle science. Today (Tuesday 15th January) we experimented with different road surfaces to find the best for our superheroes to travel as quickly as they can. We kept our superhero car the SAME, but changed the different surfaces to see which was the best. We chose the shiny, smooth plastic for the surface that made our car travel the quickest and the carpet surface made the car the slowest as it was rough, fluffy and bumpy. PE: Testing our superhero powers of throwing as high as we can, throwing as far as we can, aiming for the target and running as fast as we can. All of the children had amazing super powers! Superhero counting and number recognition. Nursery had great fun going on a superhero number hunt and having a go at recording the number of superheroes they found. Reception had to find the missing numbers that were missing. Reading our newly arrived superhero story books with our reading buddies. We loved listening to the new stories for our topic. Dressing up day for our Super Start. The children thoroughly enjoyed being superheroes. Music with Mr Bradford (Friday 14th December). 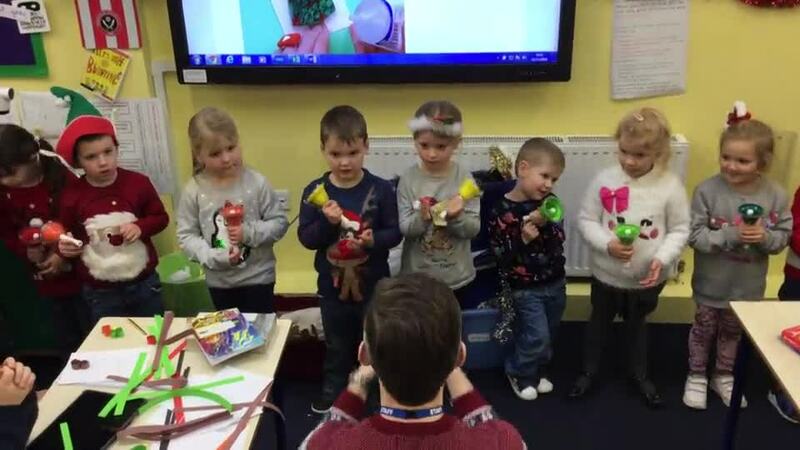 The children have been learning Jingle Bells as a group performance for the last 2 weeks. The children went into Class 4 to perform to their reading buddies. A little bit scary, but they performed so well and helped each other so much. Well done Class 1. 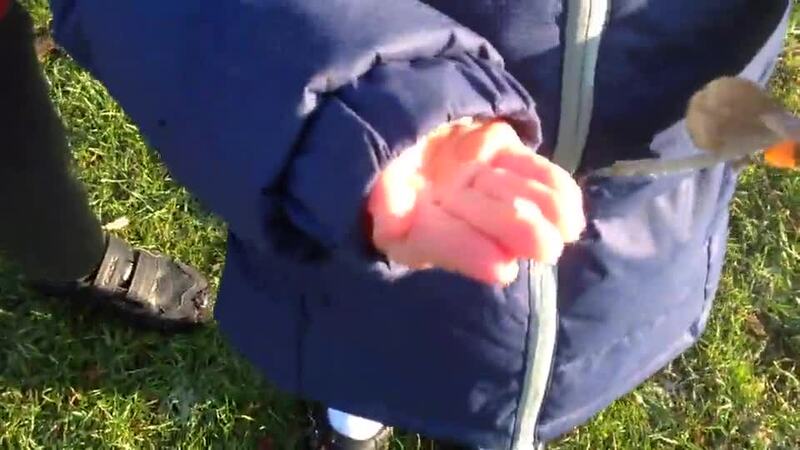 Forest School (Thursday 13th December). Photos kindly taken by Willow and Dylan. This week we had a go at using a firesteel to light a fire. The children had a great time seeing if they could use the tool. The children also had a go at building shelters. One had chairs and a television with Peppa Pig on! I love the atmospheric photos taken by the children. Well done. Class 1, with the rest of our school, made special christingles with Mrs Waller today (Tuesday 11th December) in preparation for the KS2 carol service tomorrow. We learnt all about the meaning of a christingle and had a great time making them. Thank you to Mrs Waller, Mrs Crumpton, Mrs Stone and Mrs Steed for helping us making them. Reception and Nursery went for a cold and frosty walk today (Thursday 22nd November) to explore our frosty world around us. The children were intrigued by the frost on the ground, benches and roof of the playhouse. they loved the feel of it and how the sun and warmth could melt it. We had a go at some science experiments while we were outside. We had to count to see how long it would take for the ice to melt on our fingers, in the sun and in the shade. Can you see the picture of the tyre park? We watched the parts that were in the sun melt, but the parts that were in the shadows stayed frosty as it wasn't as warm. Last week (Thursday 15th November) all of Reception and Nursery went to Forest School and had a warm, cosy campfire. The children collected willow, trimmed the wood and toasted marshmallows on the fire. We had a fantastic time. We also searched the woodland floor to find different coloured autumn leaves for a colour wheel clock in the shelter. We remembered some of the different types of tree we have in Forest School, including oak and birch. The children also had fun on our rope swing and rope ladder. The children had an exciting start to the week, as we had a letter delivered from Pudsey Bear! He was so impressed with the children's costumes last Wednesday, that he asked us to help him raise more money for Children in Need. The children decided on making biscuits to sell at the enterprise fair. First of all, we sent a video message to Mrs Roberts asking to loan some money. She sent one back saying YES! Then, we searched for a recipe, wrote down a list of ingredients, walked to the shop, spent some money, came back and made lots of biscuits! Today (Thursday 15th November) we are decorating them and on Friday selling them at the fair. We hope we can help Pudsey and raise lots of money for Children in Need. This week with our reading buddies we had a go at jigsaw building. We had to work as a team to solve the puzzle problems. This task helped us with our fine motor skills, our thinking skills, maths skills, turn taking and sharing ideas. We had great fun making the jigsaws with our reading buddies. Thank you for your help. We were really lucky today to have our first dance lesson of this half term with Claire from Dancefest. The children will be working with her for the next few weeks to help with their dances in our nativity performance. The children loved working with her and performed well, listened well and had some fantastic ideas. Letter writing and posting our letters. Today we had a lovely walk through the village to post our letters. The children spent time writing thank you letters to John the bus driver and Karis, who showed us around Legoland. During our walk to the postbox, we looked for numbers we recognised, we searched for letter sounds on signs and talked about some of the buildings in our village. We even saw Phoebe's house, but no one was in for us to have tea and cake! We spent time on rides where we had to save the princess, went to a 4D cinema show, build houses to withstand the earthquake plates and race cars to zoom down the ramps. We also spent time in Mini land, looking at the sites of Birmingham made entirely out of Lego. It took 9 master builders 9 months to create it! The children were so excited and enjoyed every minute. Their manners, thoughtfulness towards others and happy faces made us all so proud. "It's all in the hips." Dylan tells us! Autumn hats for our dads! While we were hunting for leaves for the hats we were making, we had to match the shape of the leaf to the pictures on our tree identification card. This helped us to work out what trees we have in Forest School. Class 1 and the Year 5 children have been paired up as reading partners. They have loved sharing books together. Thank you Year 5. Our Amazing Nursery Children. What a brilliant start to life at Eckington CE First School Nursery. Our First Day at Eckington CE First School! Welcome to Eckington CE First School and to Class 1 for your first term at 'Big' School. I am really looking forward to us getting started and having lots of fun with our learning. Our first topic is all about our families. We will be reading lots of exciting books about family life and creating some fantastic art linked to them. Very excitingly, some of our parents will be coming into class to talk about their jobs. This is so we can meet all the parents and learn about what they do and find out about all those different jobs our parents do when they go to work. During the term we will add lots of photos and pictures of all the interesting learning we get up to so our parents can see all the fun we are having. Reception children from Class 1 had a go on the computers in our computer room today (Friday). We used the 2Publish programme to draw our portraits. Bean bags and heads, shoulders, knees and toes today! We got our hearts pumping with lots of jumping, catching and dancing in PE. Great work Class 1! Science Experiment: Making jelly in Class 1. What do you think will happen to it when it has cooled down? Hockey in Class 1! Today (Monday 22nd October) we had a play with the small balls and hockey sticks. The children loved trying to dribble the ball around the hoops and making sure the ball didn't hit their feet! Our exciting new balance bikes. Thank you to Willow's mum for talking to us today (Monday 1st October) about your job as a nail technician. The children loved to hear about your job and really got creative drawing nail art and make up on the pictures you brought in for them. Thank you. Thank you to Poppy's mum and to George's mum for their fantastic, interesting talks about their very important jobs. The children have been re enacting the jobs that you do in our role play area. Thank you to Jessica's mum for coming into Class 1 to talk about her interesting job in an office. The children loved seeing the photos and trying on your lanyard. Thank you to Dylan's mum and Leo's mum for coming in today (Wednesday 12th September) to talk about their jobs. The children loved finding out about being an interior designer and selling cheese. We had a wonderful time. Thank you to Mr Greaves for coming to Class 1 and talking about his job. The children listened really well and then took part in drawing tall buildings together. Today (Monday 10th Sept) Class 1 got changed all by themselves, had a fun PE lesson and got dressed back into their school uniform. Well done for playing with the balls, hoops and each other so well. Our wonderful nursery and reception children stomped across the field in their wellies to explore Forest School. We had an amazing time playing games, exploring the woods, bug hunting and making seesaws! More muddy Forest School Photos. Today (Thursday 20th September) we were building shelters. In science we were testing different materials to make a shelter for the 3 little pig as well as a swing, balance beams and mud sausages and snakes linked to our phonics. What amazing maths wizards we have in Class 1. The children have been naming, identifying, drawing and manipulating 2D shapes. They have made and drawn 2D shape rockets and labelled them. In the afternoon the children then made 3D rockets and learnt the names of the 3D shapes used.